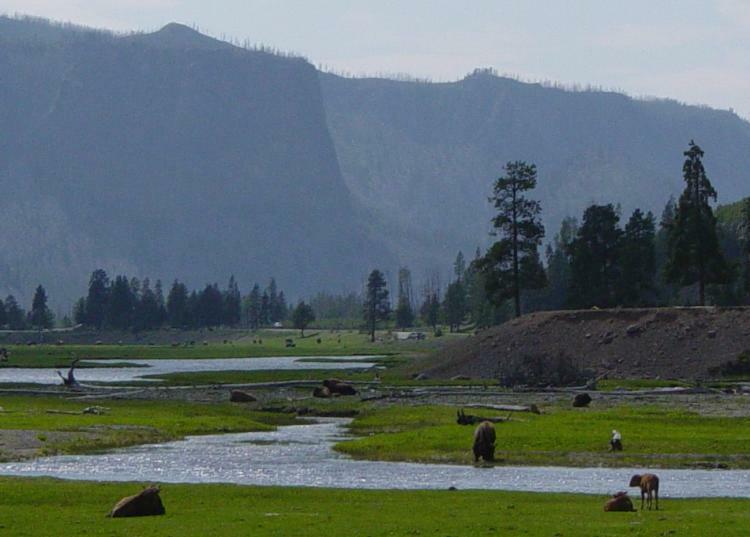 In the Northwest corner of Yellowstone National Park lies the Gibbon River, a tributary to the Madison River. Many world-class fisheries exist in Yellowstone and the Gibbon River is one that is often overlooked. Trout stocking programs in the early 1900's lead to thriving population of rainbows, browns and brook trout the river currently enjoys. The best fishing waters on the Gibbon River are easily accessed from the main roads in Yellowstone. There are however several places you can only reach by hiking Grand Loop Road out of Gibbon Canyon. Even though it fishes well, the Gibbon is usually lower on most anglers' priority list when fishing in Yellowstone. If you are looking to avoid crowds in the busy summer season, the Gibbon is an excellent place to start. The river is divided into multiple segments, and each has a different mix of trout and specific conditions. Conditions vary between sections and seasons. Some general principles hold true year over year though. The upper section of the Gibbon River below Grebe Lake, Wolf Lake and through Virginia Cascades is very small. This section has a mixed fishery of very small brook and brown trout along with some Arctic Grayling. As the Gibbon River flows past the Norris Campground, it picks up size and is now a more fishable stream with large pockets, pools, and undercut banks that holds some sizable brown trout. Below the Norris Geyser Basin, the Gibbon flows through Elk Park and the Gibbon Geyser Basin. Both of these areas are characterized by open meadows with winding pools and undercut banks. The meadows here are favored by fly fisherman. Continuing on past Gibbon Geyser Basin the river passes Beryl Springs. Here the river picks up speed and enters Gibbon Canyon on it's way to Gibbon Falls. Finally, making its' approach to Madison Junction, the Gibbon opens up into another meadow section that some refer to as Gibbon Meadows. This is a great spot to target large brown trout with a streamer during their fall spawning run coming up from the Madison River. Fishing season is short in Yellowstone (June to November), so your window of opportunity to try your luck on the Gibbon River is limited. The good news is the Gibbon is among the first rivers to clear up after spring runoff season, so you stand a good chance of landing a trophy catch if you can visit in late June. Summer is peak season for both fly hatches and tourists, so plan on dealing with traffic, other anglers at popular fishing locations throughout the park, and people stopping to observe the natural wonders of Yellowstone. A 9-foot rod with 4 or 5-weight floating fly line is recommended for the Gibbon River. You should also pack waders without felt soles (state and park regulations prohibit these). There are a number of area fly shops and can provide Gibbon River fly fishing reports. A few to check out are listed below. The fishing season in Yellowstone National park is open from Memorial Day Weekend through the first Sunday in November. Anyone over the age of 16 needs a fishing permit (available at all ranger stations). All native species of fish, including cutthroat trout, mountain whitefish and Artic Grayling, are catch and release only. Above Gibbon Falls there's no possession limit for nonnative fish, including brown, brook, rainbow, and lake trout. You may harvest as many nonnative fish from this area as you want. Below Gibbon Falls possession of up to five brook trout is allowed. Catch and release all rainbow and brown trout. Consult the Yellowstone National Park fishing regulations before your trip for the latest information. The closest airport with access to the Gibbon River is West Yellowstone Airport with connections from Salt Lake City, Utah. Larger airports are available in Bozeman, Montana and Idaho Falls, Idaho, each of which roughly is a 100-mile scenic drive. West Yellowstone, Montana is ground zero for access to the Gibbon River via the west entrance of the Yellowstone National Park. West Yellowstone, aptly dubbed "Trout Town West, USA", is a full-service community that offers accommodations, from large hotels to smaller motels. The Chamber of Commerce can provide a full listing of accommodations and a vacation planner.